The V&A at Dundee will have an important impact on Scotland, through both cultural and economic regeneration. 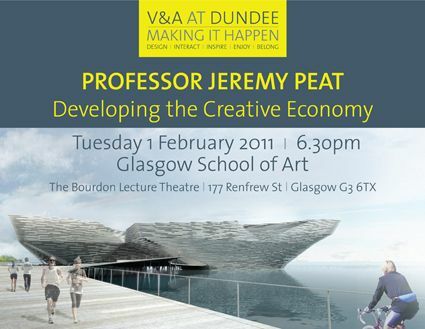 With this in mind, Professor Peat will explore the prospects for and importance of the creative sector in Scotland. He will also address existing support for the design sector given the advent of Creative Scotland and policy developments at Scottish Enterprise. the Royal Society of Edinburgh and the Chartered Institute of Bankers in Scotland. He is a member of the Competition Commission and was a BBC Trustee 2007-2010.